Warming air temperatures and associated major reductions in the Arctic sea ice cover are driving increases in ocean temperature and changes to circulation patterns in the region. These changes are expected to impact the biogeographic boundaries of a range of marine species. For example, it is anticipated that many organisms may migrate northward or become more abundant as air and ocean temperatures continue to warm. However, few pose such significant threats to human and ecosystem health as harmful algal bloom (HAB) species. Data collected over the past decade clearly indicate that multiple toxic HAB species are present in the Arctic food web at dangerous levels, and it is very likely that this problem will persist and perhaps worsen in the future. Harmful algal blooms, or HABs (commonly called "red tides"), are large accumulations of algae—both microscopic (phytoplankton) and macroscopic (seaweeds)—that affect human, wildlife, and ecosystem health, fisheries (shellfish and fish, both wild and cultured), tourism, and coastal aesthetics. Marine HAB phenomena affect virtually every coastal country, and take a variety of forms with multiple impacts. Some species produce potent neurotoxins, which can poison humans and wildlife when ingested, causing gastrointestinal distress, neurological problems and death in severe cases. One major category of impact occurs when toxin-producing species (or microscopic animals that have eaten them) are filtered from the water as food by shellfish or fish, which then accumulate the algal-borne toxins to levels that can be lethal to both human and wildlife consumers. Poisonings are also possible from the consumption of other animals that have accumulated HAB toxins through the food chain. Toxic HABs can also cause mass mortalities of fish, shellfish, seabirds, and marine mammals, due to the production of neurotoxins or through the release of potentially lethal reactive compounds (Dorantes-Aranda et al., 2015). Together, these impacts have caused significant economic losses to fishing industries, ecotourism, and coastal aesthetics in countries around the world. 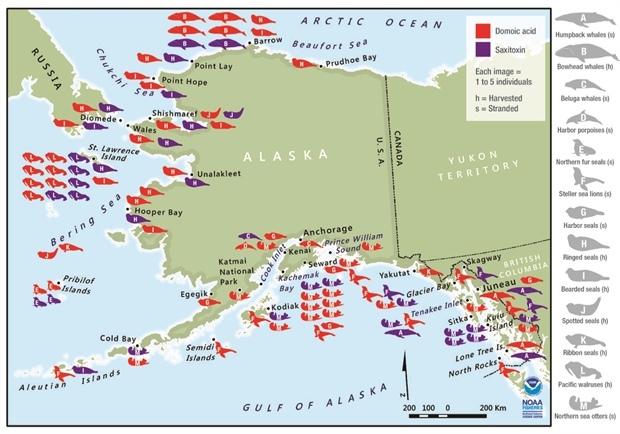 There have been reports of illness and even mortality from Paralytic Shellfish Poisoning (PSP) in Alaska going back decades, primarily from Southeast Alaska and the Aleutian Islands (Castrodale, 2015; Gessner and Middaugh, 1995). However, information on the present-day distribution and prevalence of PSP-causing species and other HAB taxa in Arctic waters is limited to a relatively small number of recent observations. Still, there is clear evidence that multiple taxa and at least five families of HAB toxins are present in the Arctic (saxitoxins, domoic acid, yessotoxins, spirolides, and dinophysistoxins/okadaic acid/pectenotoxins). Most data are for Alexandrium catenella, which produces neurotoxins called saxitoxins. Saxitoxins cause illness and mortalities via zooplankton, fish, birds, shellfish, and many other vectors relevant to subsistence harvesters in the Arctic. A second HAB group of growing concern includes domoic acid-producing Pseudo-nitzschia diatoms that poison humans or animals who eat shellfish or other contaminated marine organisms. The frequency and geographic extent of HABs have expanded in recent decades, thereby increasing associated economic impacts on food, recreation, and commerce in the world's coastal zones (Anderson, 1989; Hallegraeff, 1993; Anderson et al., 2012). Climate change, and specifically global ocean warming, have been implicated in the geographic expansion of certain HAB species distributions (Hallegraeff, 2010; Wells et al., 2015). Warming ocean temperatures, decreasing seasonal ice cover, and thinning sea ice will also serve to further expand the spatial and temporal windows for growth of endemic HAB species already present in Arctic waters (Moore et al., 2015). The northward shift of HABs means that the Arctic region is now vulnerable to species introductions and increasing bloom frequency in local communities and ecosystems that have little to no prior exposure to this phenomenon. HABs are typically formed through the growth and accumulation of algal cells in the water column. However, some HABs species, like the dinoflagellate A. catenella, have the ability to form dormant resting cysts or spores. Cysts are highly resistant cells that typically form in large numbers as blooms terminate. These cysts then overwinter in bottom sediments until environmental conditions trigger them to germinate and initiate a bloom. Alexandrium catenella strains disperse readily and are highly adaptable to new regions due to this ability to form cysts and overwinter until conditions are suitable for germination and growth. This life stage represents one mechanism by which species might colonize Arctic waters via the advective transport of cysts from southern regions. Alexandrium catenella. Collective observations over the last decade indicate that A. catenella cells and cysts are present in the Arctic north of Alaska and Canada, and within the Pacific and Atlantic inflows into the Arctic Ocean basin. More recent studies have expanded these observations considerably, particularly in the past five years (Gu et al., 2013; Natsuike et al., 2013; Vandersea et al., 2017). A recent significant observation is extremely high numbers of A. catenella cysts on the Chukchi shelf—among the highest densities ever reported for this species (Fig. 1). Alexandrium catenella were also found in the Chukchi Sea and northern Bering Sea shelves (Natsuike et al., 2017), with concentrations similar to those known to cause human poisonings and wildlife mortalities. Okolodkov (2005) published an early report of A. catenella cells near Utqiagvik (formerly Barrow), AK, and recent preliminary observations documented low concentrations of cells and cysts in the Beaufort Sea (D. M. Anderson, personal communication, 2018). In the Canadian/Greenland Arctic and subarctic, Alexandrium and PSP toxicity were first reported in Iceland in 2009 (Burrell et al., 2013) and in northwestern Greenland in 2012 (Baggesen et al., 2012). Along the Greenland coast, A. catenella cysts were present at low concentrations at nearly all stations sampled, extending as far as 76° N (Richlen et al., 2016; D. M. Anderson, unpub. data). Fig. 1. 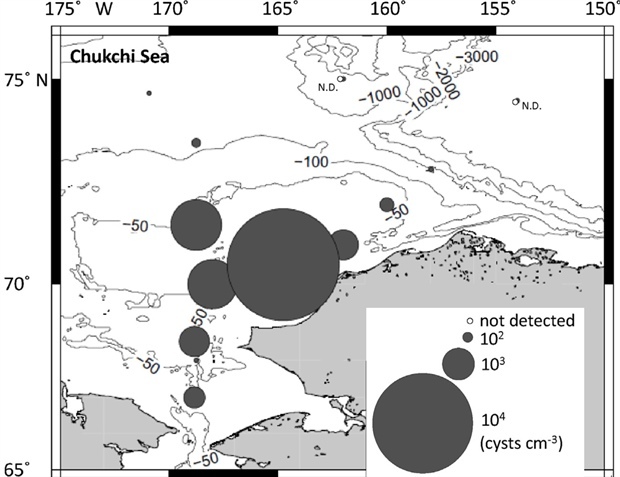 Spatial distribution of A. catenella cyst abundances documented in the Chukchi Sea during surveys carried out in 2009. Adapted from Fig. 3, Natsuike et al. (2013). Pseudo-nitzschia. Pseudo-nitzschia species are frequent inhabitants of Arctic marine waters, but less is known about their history, diversity, and toxicity than A. catenella in this region (see Booth and Horner, 1997; Percopo et al., 2016, and references therein). To date, up to eight Pseudo-nitzschia species have been identified in the Arctic (e.g., Poulin et al., 2011; Percopo et al., 2016), including toxigenic species (Poulin et al., 2011; Tammilehto et al., 2012, 2015; Harðardóttir et al., 2015), yet little is known of their biography or bloom dynamics. Impacts from toxins produced by A. catenella and Pseudo-nitzschia have been devastating to regions elsewhere in the world. Now, there is growing evidence of increasing HAB threats to human and wildlife health in the Arctic. Over the past several decades, PSP cases have increased in Alaska, which now has one of the highest incidences of PSP in the world. In addition to increasing numbers of human illness, there have also been recent and significant impacts to wildlife. On Kodiak Island, PSP toxins were implicated in the deaths of Kittlitz's Murrelet chicks during the 2011/12 breeding season (Shearn-Bochsler et al., 2014). High toxin levels were observed in nearly 90% of the nestling carcasses and thought to originate in insectivorous sand lance, a known vector for HAB toxins (Shumway et al., 2003). In August 2016, saxitoxins were also found in moderate to high levels in four animals sampled from a stranding event involving 39 walruses found dead in Bering Strait. This event prompted a public warning regarding consumption of contaminated fish and shellfish, including those taken directly from the guts of harvested walruses, which is traditional practice in some communities (Alaska Sea Grant, 2017). In the Alaskan Arctic, recent surveys have found saxitoxins and/or domoic acid in many harvested or stranded marine mammals (Fig 2; Lefebvre et al., 2016). Notably, all species tested contained domoic acid, in spite of different foraging strategies, i.e., among seals (which may follow receding ice into the Chukchi Sea) and whales (which range between the southern Gulf of Alaska to the eastern Beaufort Sea). Some toxin levels were comparable to those found in dead or incapacitated marine mammals that were diagnosed with domoic acid poisoning during severe Pseudo-nitzschia blooms along the US West Coast. Fig. 2. Locations where HAB toxins were detected in stranded (s) and harvested (h) marine mammals. Red represents species positive for domoic acid and purple represents species positive for antitoxin. Marine mammal species are listed as follows: (A) humpback whales, (B) towhead whales, (C) beluga whales, (D) harbor porpoises, (E) northern fur seals, (F) Seller sea lions, (G) harbor seals, (H) ringed seals, (I) bearded seals, (J) spotted seals, (K) ribbon seals, (L) Pacific walruses and (M) northern sea otters. (Source: Lefebvre et al., 2016). The warming Arctic Ocean may be experiencing an increase in the extent and magnitude of toxic HAB populations, posing considerable threats to human and ecosystem health. The impacts of this expansion will be significant in a region where traditional monitoring programs for toxins in shellfish or fish are not feasible due to remote and expansive coastlines. Management efforts going forward will be fostered by the recent creation of the Alaska Ocean Observing System's Alaska Harmful Algal Bloom (AHAB) Network, which was formed to coordinate among diverse coastal stakeholders for HAB awareness, monitoring, and response in Alaska. Warming ocean temperatures, decreasing seasonal ice cover, and thinning sea ice could further expand the spatial and temporal windows for A. catenella germination and growth in surface waters (Moore et al., 2015). These conditions will also likely support increased growth and expansion of toxic Pseudo-nitzschia species that exist within the Arctic. New observations and environmental monitoring are central to improving the understanding of the growing distribution, abundance, and impacts of HABs in the Arctic. Such observations will also serve to provide a baseline against which future climate change effects can be assessed and to guide management and mitigation strategies in this critically important system. Support for DMA and MLR was provided by and by the National Science Foundation (Grants OCE-0850421 OCE-0430724, OCE-0911031, and OCE-1314642) and National Institutes of Health (NIEHS-1P50-ES021923-01) through the Woods Hole Center for Oceans and Human Health. Additional funding was provided from NOAA through the Cooperative Institute for the North Atlantic Region (CINAR) (NA14OAR4320158) and by the National Science Foundation Office of Polar Programs (OPP-1823002). Richlen, M. L., O. Zielinski, L. Holinde, U. Tillmann, A. Cembella, Y. Lyu , and D. M. Anderson, 2016: Distribution of Alexandrium fundyense (Dinophyceae) cysts in Greenland and Iceland, with an emphasis on viability and growth in the Arctic. Mar. Ecol. Prog. Ser., 547, 33-46.